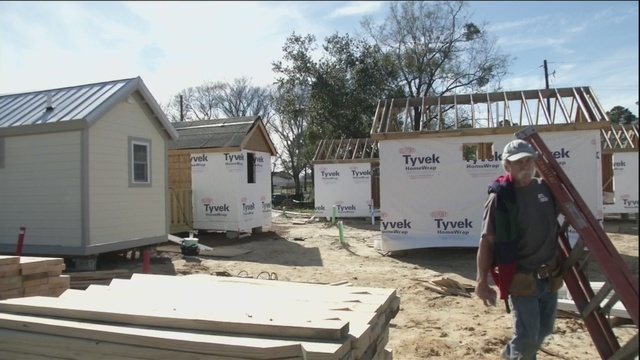 SAVANNAH, Ga. (WSAV) – Homeless veterans in Chatham County are steps closer to living with a roof over their heads. After four years of waiting, crews are finally starting to build 72 tiny homes near Dundee Street. So far, crews have started construction on six homes. Now, the focus is on building the rest as soon as they can. “Every day that we delay getting these things complete, it’s another day someone is living on the street, or in a cardboard box, or in a tent,” said Gordon Hitt, a volunteer. During phase one, volunteers like Hitt — in addition to paid contractors — will build 23 of the tiny homes. They’re equipped with full kitchens, full bathrooms and a bedroom. It all fits in a 26-square-foot space. “I get a little more teary-eyed now because I think of the early days that were highly frustrating on many levels — from raising money to getting approval,” said Cindy Murphy Kelley, Executive Director of the Homeless Authority. When phase two and three are done, 72 tiny homes, a clubhouse and clinic will share the space. “I’ll be here until the last house is built and then we will come back as Cindy Kelley needs help with maintenance,” said Hitt. It costs $240 per month to live in a tiny home. June is the expected completion month. Kelley says there are more than 200 homeless veterans in Chatham County. “The way to prevent that is housing one person at a time. That’s the best we can do,” she said. Previous PostThe Long Lines for Women’s Bathrooms Could Be Eliminated. Why Haven’t They Been? Next PostLife in a tiny house: what’s it like and how can it be made better?